As a home entertainment desktop replacement, the Samsung Series 5 550P succeeds on almost every level. The large screen and powerful graphics make watching movies or surfing the web a pleasure. And, thanks to the wide and comfortable keyboard, workaholics will feel right at home. The Series 5 550P, unlike the slim and light Series 9, or the gigantic Series 7 Gamer, is firmly covering all its bases. So although you won't be able to forget you're carrying it - or fire up Battlefield surrounded by pulsing LED lights - you'll find that there's enough power, features and battery life here to handle almost all your needs. The Series 5 550P is available in 15-inch and 17-inch models. Our review sample was the 17-inch model and, although this makes it bulkier and heavier, at 408 x 270 x 31mm and 3kg respectively, it also means a higher resolution screen. The 15-inch model packs a standard 1,366 x 768 pixels but for the 17-inch it's been bumped up to 1,600 x 900. The matte finish on the screen means there are no reflections from bright lights, so you can work comfortably in well-lit areas. Battery life is a concern though. We looped high-def video alongside our battery benchmark program and recorded a score of 195 minutes before the battery died. This isn't a bad score by any stretch, mind, and more conservative usage will give this machine better staying power. The Samsung Series 5 550P features an Intel Core i7-3610QM CPU, part of Intel's Ivy Bridge line-up. These third-generation chips are built on a new architecture with the aim of getting better performance from less power. The low-voltage chips are part of the reason why the battery life here is stronger than in the earlier, second-generation model. On top of the Ivy Bridge CPU you'll find 6GB of RAM and integrated Intel HD 4000 graphics. Like the earlier Intel HD 3000 graphics, the newer chip will handle graphics-related tasks such as gaming, video editing or streaming video content. On top of that, Samsung has included a dedicated Nvidia GeForce GT 650M graphics card. This adds an extra 2GB of dedicated video memory and lets you get on with some pretty serious gaming action. You might struggle with the latest games on full detail settings, but we were fine playing the majority of our (admittedly ageing) gaming collection on this laptop. This reflects the Series 550P's multimedia credentials, and if you want to get stuck into some video editing or web coding you'll also find the tools you need here. Although slim laptops and Ultrabooks forego an optical drive, the Series 5 550P comes with a built-in Blu-ray drive that will come as a relief to those who still buy software on discs or have an extensive movie collection. If you're more the digital sort, then the 1TB on-board storage should be enough for your music, video and games. In fact, multimedia is where this laptop shines thanks not only to the large 17.3-inch screen, but also the integrated JBL speakers. There's a solid speaker bar that runs the length of the screen hinge, as well as a subwoofer nestled underneath the chassis. The volume will go up reassuringly high, and the sound balance is excellent. For anyone wanting a workhouse desktop replacement, usability is particularly important and the Series 5 550P doesn't disappoint. The wide, isolation style keyboard is cut through the chassis and Samsung has included a numeric keypad that should be well received by spreadsheet lovers. The travel on the keys is spot on and we found we could type quickly and easily, without any miss-hits. There's also plenty of space on the palm rest. The large touchpad is a smooth, brushed metal construction with two solid click buttons that responded well to frequent hammerings. The usual assortment of connections have been included such as four USB ports (two are USB 3.0) and HDMI and VGA. There's also an Ethernet port in case you don't want to use the 802.11n Wi-Fi connection, and space for an SD card reader. What's also refreshing is that the Samsung Series 5 550P doesn't come pre-loaded with bloatware. The Series 5 550P isn't the complete package. We noticed a spot of flex either side of the keyboard and the screen hinges don't feel as sturdy as some of Samsung's other offerings. Then there's always the desire for a few extra features. A backlit keyboard would have been a nice addition, as well as sleep-and-charge or a Full HD display. Overall, there's plenty to like about the Samsung Series 5 550P. And if you're after a laptop for the house that will comfortably handle all the family's demands this should be on your shortlist. The power of Intel's third-generation chip is front and centre and means this laptop can not only handle any program you throw at it, but also stay fast and smooth during usage. Other benefits are the excellent keyboard, dedicated graphics, speakers and impressive 17-inch screen. We weren't blown away by the design and portability is almost non-existent, but the rest of this laptop speaks for itself. 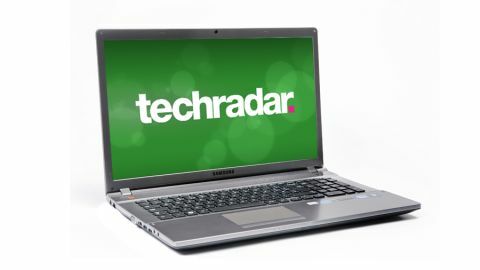 The Samsung Series 5 550P is a solid all-round machine benefitting from the latest top-tier processor that will make the ideal family laptop for the next two or three years.